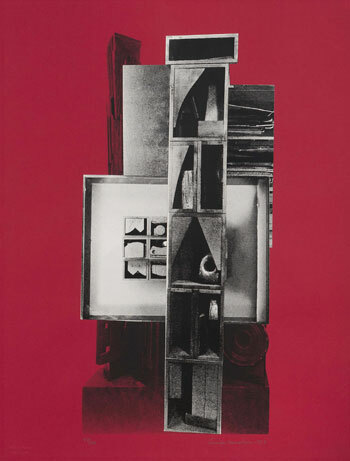 “Committed to Paper: Master Drawings and Prints by Sculptors,” is curated from the Frederik Meijer Sculpture Gardens‘ permanent collection of works on paper, which includes pieces by such modern masters as Alexander Calder, Henry Moore, and Louise Nevelson, as well as notable contemporary artists including Kiki Smith, Roxy Paine, Magdalena Abankowicz. Works on paper are not typically on display because due the fugitive nature of the media, ideally they should not be exposed to light for extended periods of time. This exhibition is an opportunity not only to see prints and drawings otherwise relegated to archival storage, but also gain insight into the working process of some noteworthy artists. Three broad categories of works on paper are included: preliminary studies for sculptural projects (in some cases, those displayed in the gardens), studies of existing works by the artist, and two-dimensional works that are part of the artists’ studio practice. Preparatory drawings are like original manuscripts, because notations and omissions reveal something of the author’s thought process. Historically regarded as fragmentary or mere artifacts of an “important” finished work, opinions about the medium of drawing have evolved over the past two centuries. Drawing is regarded as a viable primary medium of expression, no longer low in the hierarchy of two-dimensional works, with oil painting positioned at the apex, leaving water-based media, printmaking, and drawing to scrap-around for second or third place. There is a direct fluidity to the process of drawing, unlike paint for example, which requries reloading the brush. Spontaneously rendered and absent any evidence of hesitation or erasure, drawings can effectively illustrate the gestural bravado and confidence of the artist. Beverly Pepper’s oil stick drawing Curvae in Curvae II, and the untitled ink and marker drawing by Mark di Suvero, embody these qualities. There can also be something vulnerable about drawings, perceptible in the hesitance of a searching line, or iterations that deviate from the final product, as seen in Alexander Liberman’s nine studies for Aria (c. 1979). While preliminary studies are probably what one expects to see in the exhibition, there are many surprises, including a 1966 series of silkscreen prints by Louise Nevelson, created in response to poems by Edith Sitwell. Apparently conceived as an artists’ book or dossier of prints and broadsides, four of the suite of twelve are displayed. Kenneth Snelson‘s untitled photographic print on shiny silver paper, creates a disorienting vortex of progressively diminishing star shapes (like Guarino Guarini’s cupola of the Sindone Chapel), while at the same time suggesting the metallic wallpaper en vogue in the 1970s. Peter Randall-Page‘s aquatint series Entomology II-IX, (2010), also suggests 1970s wallpaper of the flocked variety, featuring a hybrid damask/Rorschach test/brain scan motif that is repeated with variation in each print. There are a number of works that must be seen first-hand to be fully appreciated, like George Rickey‘s embossed paper pieces, David Nash‘s velvety charcoal, King and Queen (2008), and Arnaldo Pomodoro‘s serigraph, Sfera (1964-69) with lush metallic copper and green-gold inks, that evoke the bronze surface of the original piece in the sculpture collection. Sfera, is one of several works on paper that are unexpected compared to the sculptural examples in the Meijer collection. Jaume Plensa‘s, Veiled Shadow XVIII (2011) is an uncanny collage/painting on acetate, very different than his sculpted figures comprised of steel letters like, I, you, she or he…, (2006). Bill Woodrow‘s contributions are two surreal mixed media works created with ink and pollen. One resembles the biomorphic forms of Yves Tanguy, the other includes overlapping silhouettes of animals suspended by their haunches. These interesting little drawings were quite unexpected from the artists who created Listening to History (1995), which consists of a giant head (a ubiquitous motif in contemporary sculpture), bound to a book.